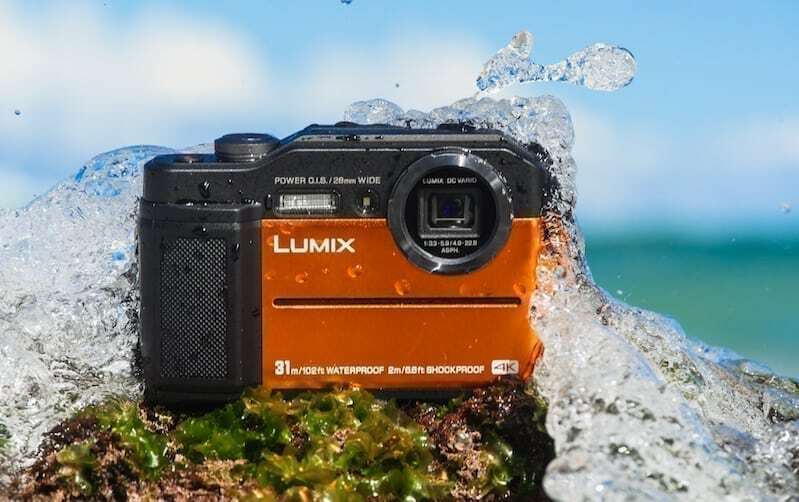 In this Gadget Gauntlet review, Evan Kelly takes a look at Panasonic’s new Lumix DC-TS7 camera. He tests it’s durability, it’s photo quality, and it’s sense of humor. What’s up guys? It’s Evan with Innovation and Tech Today, here with yet another episode of Gadget Gauntlet. Today we have the latest camera in Panasonic’s rugged TS series, the DCTS7. Let’s check it out. Now I am personally a huge fan of cameras. In fact, I’m actually shooting this with a camera as we speak. This highly rugged and durable camera specializes in outdoor photography, and it’s primarily used for those of us that don’t want to worry about the well being of our camera during the rough elements. First off I just really want to say that I really love this orange on the front. Cameras tend to look pretty boring these days, so its nice to see a splash of color in this series. Or, if you want it, it also comes in blue. Right away I feel how durable it really is. It feels like I could throw this camera out the window, and it would be totally fine. See? Random video: [inaudible 00:01:00] Oh my God! Oh my God! Not even a scratch. Also, it is completely waterproof up to 102 feet below the surface, more than twice the depth of the TS6. Thankfully you’ll probably never have any reason to be 102 feet underwater, unless of course, you’re Aquaman, which let’s face it, is by far the lamest superhero in the DC universe. The camera is also completely shock proof, dust proof, and can fully operate in temperatures as cold as 14 degrees fahrenheit. Also, it can withstand 220 pounds of force. Take that The Hulk. As tough as it is, it is also extremely versatile. It includes an electronic compass, an altimeter, and a built in 0.2 inch live viewfinder that offers 100% field of view. In terms of image quality, I’m actually very impressed with this camera’s performance. Let’s take some photos around the office to try it out. Evan starts awkwardly taking pictures of his coworkers. All kidding aside, this camera really does take high quality photos, and you’ll be able to beautifully capture moments throughout your adventures. Well, that’s the Panasonic Lumix DTS7. It is a major upgrade from the TS6, and is the perfect camera for those of us who are intense adventurers and don’t want to worry about the well being of our cameras. It’s priced at 447 dollars and 99 cents, which is a pretty fair deal when you consider the fact that this camera will certainly last you a very long time. Be sure to subscribe for more awesome product reviews, and don’t forget to like and follow us on Facebook, Twitter, and Instagram. I’m Evan with Innovation and Tech Today, thanks for watching. Peace.